There is something very magical about receiving flowers at Christmas time. Maybe it’s the seasonal festiveness, or maybe it’s the fact that we are receiving something beautiful and alive even as the snow blankets our lawns. 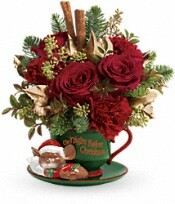 Teleflora offers some fantastic holiday arrangements which would make a wonderful hostess gift as you travel to holiday parties, a splendid last minute gift idea for those hard to shop for or even a kind gift to send to your dear ones who live further away. Teleflora works with over 15,000 local florists that can give your creations those special touches that we would expect from a local neighborhood store. The flowers are delivered in a beautiful vase and can even be delivered on the same day. 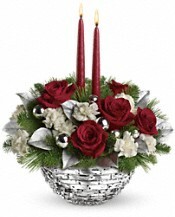 Teleflora’s holiday arrangements include a Sparkle of Christmas centerpiece in a stunning glass bowl with red roses and accent white flowers along with red candles. 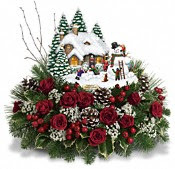 Another arrangement is the Thomas Kinkade Memorial Winter Wonder with a hand crafted winter wonderland scene sitting on top of a beautiful floral arrangement, this is sure to light up the hearts of the young and the young at heart. A cozy gift can be a ceramic mug filled with a vibrant bouquet of flowers and a tiny ceramic mouse sleeping on the saucer in Teleflora’s Send a Hug Night Before Christmas arrangement. There is a variety of stunning and nostalgic arrangements which can go far beyond a simple flower delivery. Bouquets like this can truly make it on everyone’s’ Christmas wish list.